Human rights in Georgia are guaranteed by the country's constitution. There is an independent human rights public defender elected by the parliament to ensure such rights are enforced. However, it has been alleged by Amnesty International, Human Rights Watch, the United States Department of State and the Georgian opposition that these rights are often breached. 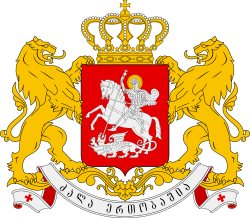 In addition around 20% of the territory of what was the Georgian SSR is in dispute (occupied in the view of the government in Tbilisi and many other countries) and there have been frequent allegations of human rights abuses in these territories as well. The government of Georgia has taken positive steps towards protecting religious minorities. Attacks against those of different faiths have subsided since the revolution, and a leader of these attacks, Vasili Mkalavishvili, was arrested and incarcerated by the authorities. Prime Minister Zurab Jvania was a key supporter of allowing religious organisations recognition from the state, but he faced considerable opposition from his own government: his own president said that the state should do what it can to 'protect Georgia from harmful alien influence.' Despite reforms allowing minority churches to register themselves in 2005, the Georgian Orthodox church has a considerable monopoly in Georgia, whilst minority groups find it hard to even build places of worship. The 2002 concordat between the G.O.C. and the Georgian government, is still in place. which grantes the Georgian Orthodox Church a privileged status in Georgia, and endows it with authority over all religious matters. It is the only church that has tax-free status, and it is often consulted in government matters. Together with being free of tax, Georgian Orthodox Church also gets some financing from the government as well. The main reason for this is that the church has always been very active in country's cultural development and just like in most Eastern Orthodox countries, the line between culture and religion is blurred. Georgia has ratified the Framework Convention for the Protection of National Minorities (FCNM) in 2005. The NGO "Tolerance" points out in 2008 that several of the articles of the FCPNM have been exempted from full implementation by the Georgian parliament. Specifically, provisions regarding full expression in the minority's languages in cultural, educational and administrative matters have been compromised, Tolerance claims. For example, the number of Azerbaijani schools has decreased, and cases of appointing headmasters to Azerbaijani schools who do not speak Azerbaijani are cited. During the 2007 Georgian demonstrations, the riot police attacked the headquarters of Imedi channel, leading it to off the airing of demonstrations. For years, human rights organizations urged President Saakashvili and his government to look into alleged atrocities in Georgian prisons. In 2010 the Human Rights Commission of the Council of Europe reported “The living conditions in prisons and prison camps of Georgia – also known under their euphemistic name as "correctional facilities" - are not conducive of improved outcomes for inmates. Quite the contrary: The system amounts to an offence against international standards for correctional facilities. Requests for help in order to stop torture in their prisons are common. As prisoners are afraid of aggravating the situation, they avoid naming individual torturers. As of 2010, the availability of medical care in prisons and camps was totally inadequate leading to a very high mortality in Georgian prisons. The human rights of the inmates are simply being ignored." Many other organizations have warned the Saakasvili government, including the United States Department of State in 2008. Despite the worldwide warnings to the Saakashvili government, the United National Movement Party regarding human rights in Georgian prisons, watchdog organizations reported little or no improvement. The European Union strongly condemned the abuse of prisoners and urged the Georgian authorities to punish the culprits. EU foreign policy chief Catherine Ashton said she was "appalled by the shocking footage of abuses committed against inmates in Gldani prison. It is of vital importance that these and other incidents are thoroughly and transparently investigated and that those responsible are held to account," she said in a statement. Rupert Colville, a spokesman for the United Nations human rights office in Geneva, urged Georgia to "promptly, impartially and effectively" investigate all cases of abuse and take steps "to ensure that prisons and detention centers are managed in line with international human rights law and standards." The questions from human rights organizations worldwide come on the heels of international concerns about free and fair elections in Georgia in 2012. On January 13, 2013 190 people designated political prisoners by the Parliament of Georgia were released from prison under an amnesty law sponsored by Georgian Dream legislators which passed in 2012 over the veto of out-going President Mikheil Saakashvili. ↑ Amnesty International on Georgia Archived July 24, 2009, at the Wayback Machine. ↑ Georgia International Media Centre on human rights Archived February 25, 2012, at the Wayback Machine. ↑ "2008 Human Rights Report: Georgia". 2008 Country Reports on Human Rights Practices. US Department of State. Retrieved February 25, 2009. 1 2 "Georgia: UN condemns prisoner abuses exposed in television footage". UN News Centre. www.un.org. Retrieved 21 September 2012. ↑ "EU newcomers urge fair polls in Georgia". www.eubusiness.com. Retrieved 17 September 2012. ↑ Olesya Vartanyan (January 13, 2013). "Georgia Frees 190 Inmates Deemed Political Prisoners". The New York Times. Retrieved January 14, 2013. Have the rights of religious minorities improved? US State department's International religious freedom report, 2005. IDP Voices - Read and listen to life stories from displaced people in Georgia.